So, I think I might have finally cracked this favourites post thing! *insert shocked emoji face here. * I didn't believe such a thing was possible. Today I will be sharing all the things I was loving during the month of November, as always we have a bit of a mix of beauty, skincare and random bits and pieces. 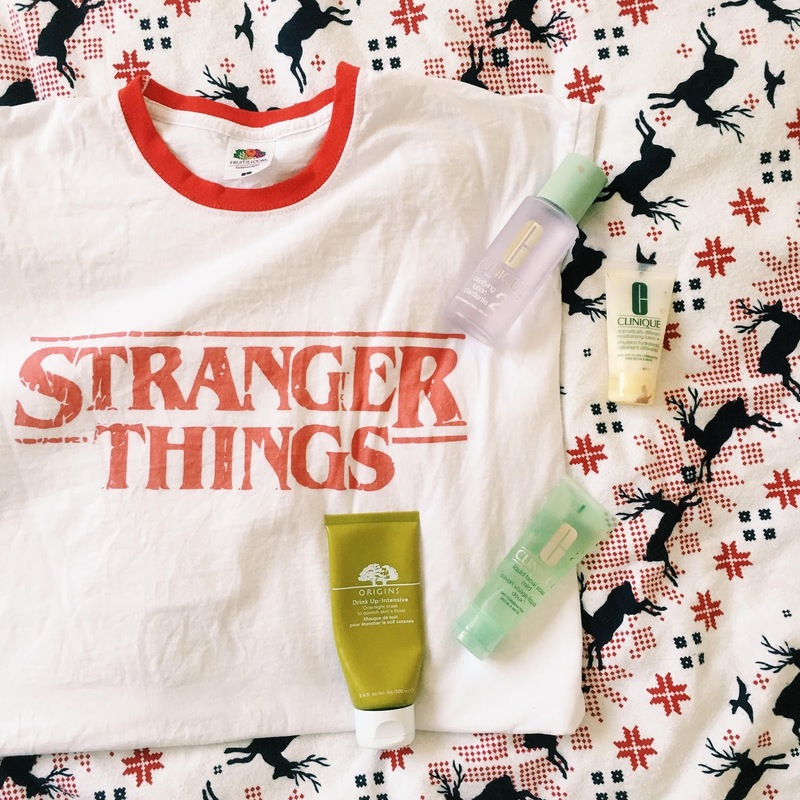 Would it really be a favourites post if I didn't mention Stranger Things 2? It's no secret that I am absolutely obsessed with this programme and I've already written a separate post which basically consists of me fangirling about it, so you can read that here. Stranger Things is one of those programmes that completely nails it in every aspect. The casting is on point, it is incredibly well written and it's just very aesthetically pleasing, the fact that this season was set during Halloween was just the best thing ever. I have very strong feelings about this show and hope that it continues to surprise me and blow my mind in season 3. The standout performance for me was from Noah Schnapp who plays Will Buyers. He is such a talented young actor and really shone this series, seriously this kid deserves all the awards this year. If I didn't mention a hair dye in this post then something would be seriously wrong. During November I said goodbye to pink hair and hello to peach hair. To create this colour I used my old favourite Bleach London, the colours I used to achieve this colour were Awkward Peach and Washed Out Orange. I opted to use Bleach London because I have used these colours in the past to create peach hair and I was so pleased with how the colour turned out that I knew it would work well. Bleach London is one of the best for creating pastel hair colours as the product is already diluted with conditioner. I am looking to test out some new hair dye brands for the new year, but I imagine that I will always finding myself reaching for these dyes to create some dreamy pastel looks. If you want to know how I dyed my hair peach you can read my post explaining my method here. We are officially into the chill of Winter and as such my skin is taking a battering, it's become so dry and cracked, so I've really been trying to take better care of my skin by actual creating a daily skincare routine. I found myself reaching for this Clinique skincare set that I actually received for my birthday last year. It is the 3 step skincare set for dry/combination skin. The first step is a mild liquid face soap. I use this after I've taken my makeup off or first thing in the morning, it leaves my skin feeling so fresh and extra clean. This second step is the Clarifying lotion, this is especially good for getting right into the skin and getting rid of any excess makeup and dirt, you can definitely feel this working, the only issue I have with this product is that it smells slightly chemically. The third product in this set is the Hydrating Moisturiser, I normally only reach for this product in the morning as it makes your skin feel very fresh and awake, my face feels so new after I've used this product. A little definitely goes a long way with this product, so make sure you don't use too much at once otherwise it can leave your face slightly greasy. Netflix has really out done itself with programmes this year, I've been seriously binging over the last couple of months. My current most favourite is probably Mind Hunter. Set during the late 70's, the show depicts the beginnings of criminal psychology and profiling at the FBI. The programme mainly focuses on FBI agents Holden Ford and Bill Tench, who begin to interview serial killers to attempt to understand the psychology behind the murders to help solve ongoing cases. This programme is right up my street, I love anything to do with serial killers, it's such a fascinating topic to me. I won't give away too much information as I intend to write a more in depth post on why I like this programme so much. 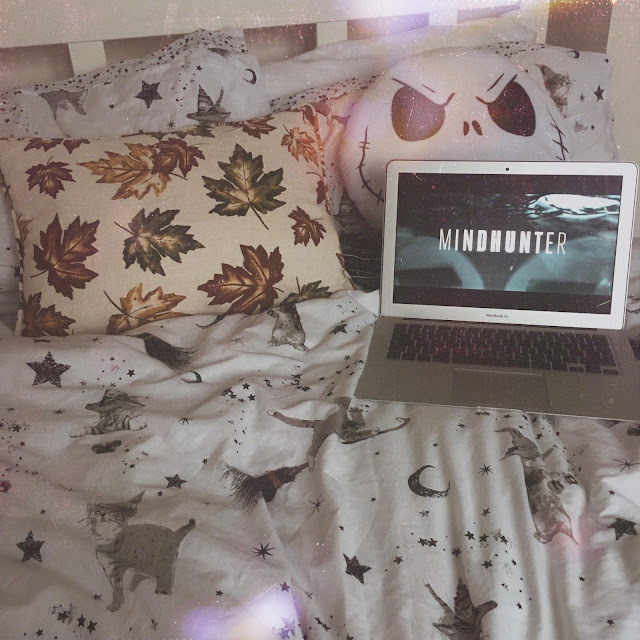 Mind Hunter is a bit of a slow burner action wise, as it features a lot of talking and psychological aspects, so it definitely requires concentration, but it's 100% worth it. I'm so excited to see what direction they take it in next season. If you, like me are a bit of a weirdo and are interested in serial killers then this is definitely one for you. The last item is another Skincare one, Origins Drink Up Intensive Overnight Mask. I use this product a couple of nights a week before I go to bed just to give my skin a bit of extra moisture for when I'm asleep. The product is designed to 'quench skin's thirst' and I do definitely notice that my skin feels a lot more hydrated on days when I've used this the night before. The consistency is very light, it doesn't weigh down your face or make it feel greasy because it sinks into the skin so quickly. So there we have it, all the things I was loving during November, I can't believe the year is nearly over. I can't wait to try lots of new stuff in 2018, I definitely want it to be one for stepping out of my comfort zone. Hopefully I can end the year on a high and have my December favourites up before the end of the year, we shall see. Do you have any recommendations for me based on any of the things I've mentioned? Specifically hair dye brands, I have lots of colour plans for the new year so let me know your favourite colours and go to brands.